I am so excited with the upcoming summer ! I love the flavor of summer food. That is finally the time of the year when you can enjoy tons of fresh herbs and vegetable. And as a French girl for me summer is all about eating Mediterranean food. I always had a passion for Greek food and while I traveled in Greece I fall in love with Tzatziki. It is a very healthy fresh summer dip that you can use in as a sauce in sandwich or as a dipping sauce with vegetables. All you need is 6 basic ingredients that we all have in the pantry and fridge. 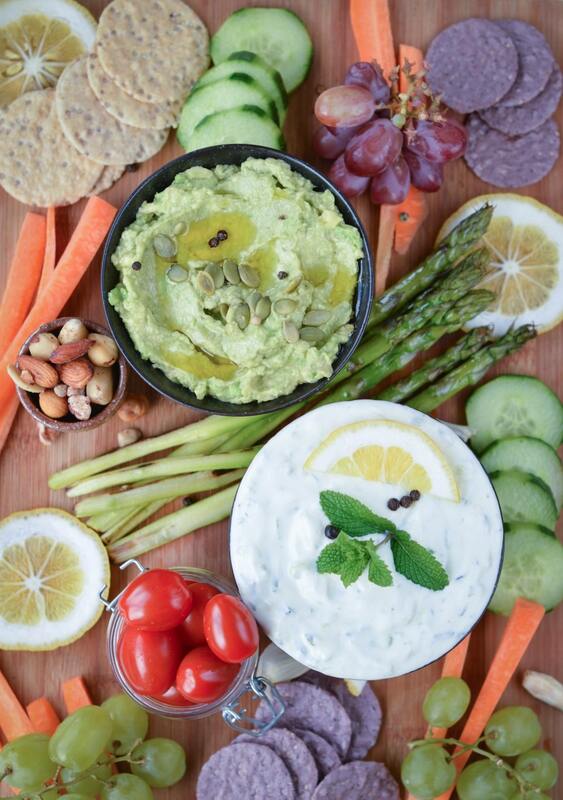 I love to serve this dip on my Friday finger food platter with a homemade avocado dip – recipe here, nuts, crackers and raw vegetables sticks. Tonight I also added some grilled asparagus and fresh grapes as it is in season. It is usually made with Greek yogurt which I love but today I am sharing a dairy free tzatziki option. I had lots of request lately to see more dairy free dipping sauce on the blog. So this is another one! 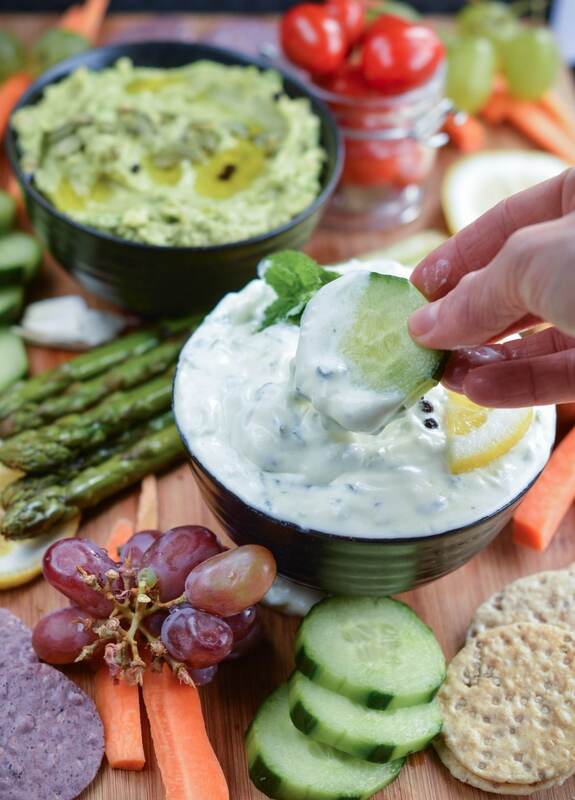 This vegan tzatziki dip is not using tofu as vegan used to make it. I simply use thick dairy free coconut yogurt. I used the Coconut Collaborative Yogurt in New Zealand. It is a thick dairy free yogurt made with coconut cream and very close in texture to Greek Yogurt. 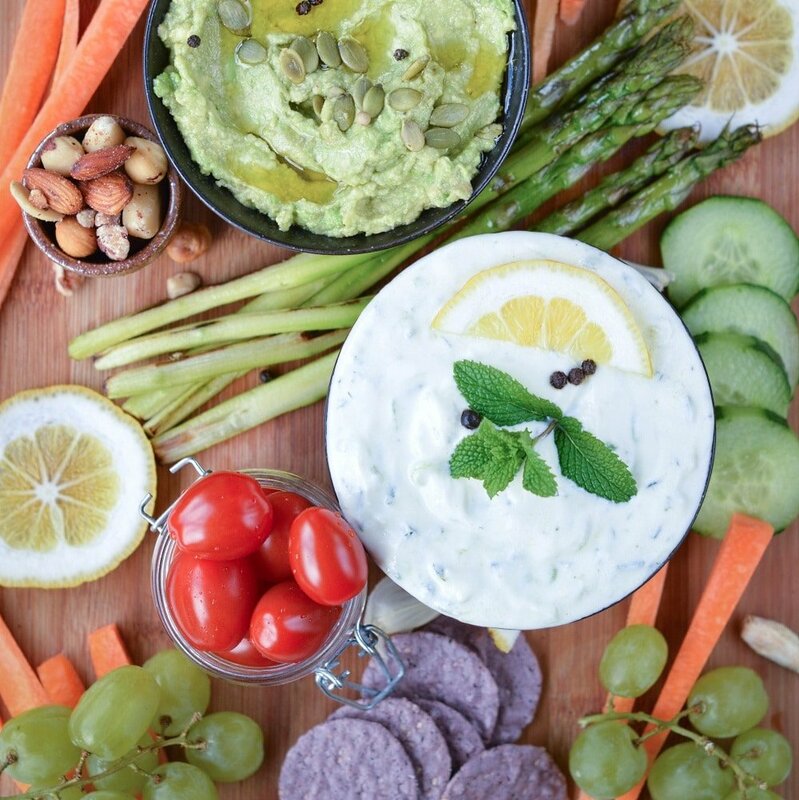 I absolutely love the light coconut flavor it had to this vegan tzatziki dip. 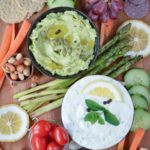 If you are not vegan you can use this vegan tzatziki sauce recipe and simply swap the coconut yogurt by Greek yogurt. Even low fat Greek yogurt work well if you want to reduce the calorie of your dip. I love to spread this vegan tzatziki sauce into sandwiches but it also makes a nice dip for kids lunchbox or as a party dip appetizer. Slice the cucumber in half and scrape out the seeds. This part has to be removed to avoid water into the dip. 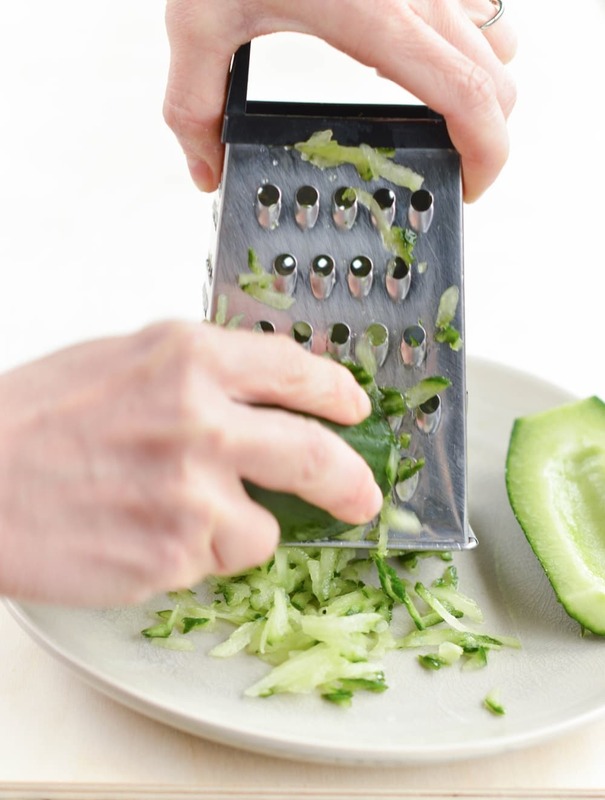 Grate the remaining cucumber part. Squeeze out the extra liquid with your hands. Discard the liquid. Place the grated cucumber into a small bowl. In another bowl combine olive oil, crushed garlic clove, finely chopped mint, lemon juice, salt and pepper. 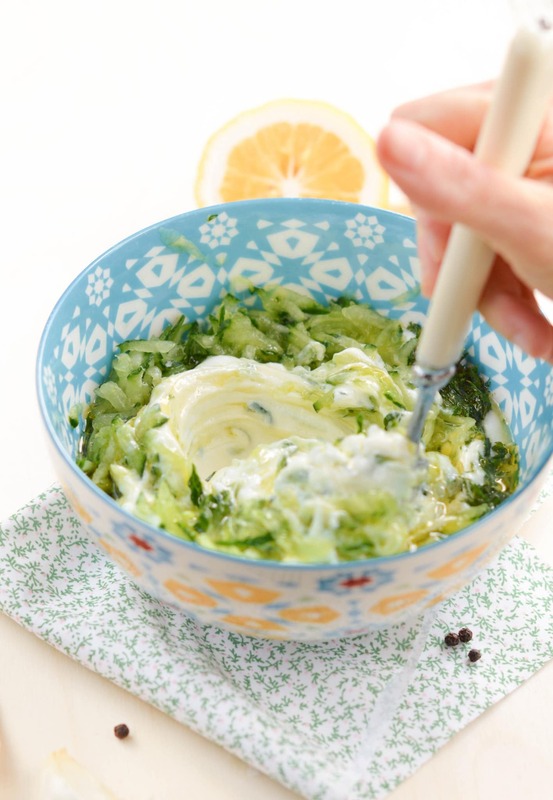 Stir into the grated cucumber and finely stir in the dairy free coconut yogurt until it forms a thick dip. Cover the mixing bowl with plastic wrap and store in the fridge for at least 2 hours to let the flavor blend. Serve with falafel sliders or as a dip for appetizers. 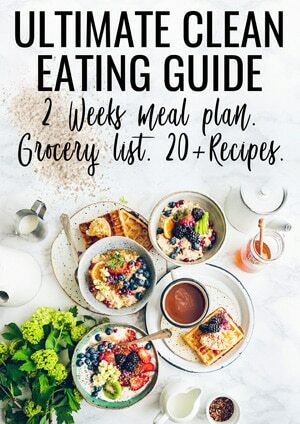 Could I use full fat coconut in place of coconut yogurt? Sure! I would use coconut cream from the can it will make a delicious creamy dip ! Enjoy the recipe on the blog. XOXO Carine.